NOTICE: Your email company may be deleting or blocking your messages without your knowledge. My last posting arrived blank at dozens of subscribers. This is routine, they do it for many reasons, some of which are really awful. The only way to prevent this is to add my email address, and any you don't want to miss, to your email White List. You need to figure out how to do that on your end, to guarantee you get emails you want, and to prevent secret deletions. Alan. 1. I've been granted a reserved seat at the U.S. Supreme Court for the McDonald v. Chicago gun-ban case (oral arguments are on March 2). Watch for my eyewitness reports, like I issued for the Heller case. If you're attending be sure to say hello. 2. Meet me at the SHOT Show, 700,000 square feet of Shooting, Hunting and Outdoor Trade in Las Vegas, Jan. 18 - 21. Leave word for me at Circus Circus or in the press office at the show. 3. The 2010 Travelers Guide is now available! 4. 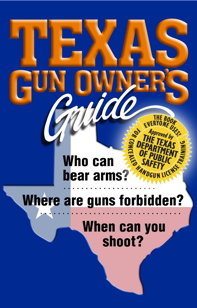 TEXANS -- the new 7th edition of The Texas Gun Owner's Guide goes on press this week! Blazing new cover and... Castle Doctrine, Stand Your Ground, "Freedom to Carry" in vehicles including RVs, Rights Restorations, a ton of new good laws. Store owners should clear out inventory at a discount (it remains current with the update insert, free on our website); out with old, in with the new! Place an advanced order, get them first, 1-800-707-4020.
along with governor Rick Perry and more. Suzanna and I will also be at TCHA, March 6 - 7 in Kerrville, she'll have her new book for autographing at both events, get details at http://www.txchia.org/evt0310.htm. in people's minds and some state legislatures. So-called "right to carry," which requires government interference, paperwork, applications, approvals , taxes called "fees," mandatory classes, written tests, shooting tests, plastic-coated permission slips, fingerprinting, photographs, entries into criminal databases and expiration dates for your "rights," well, this has definitely moved the right to bear arms significantly ahead. Is it time to go further and reach "Freedom To Carry"? Also called Vermont- or Alaska-style carry, basically the government stays out of your face as you exercise your fundamental human and civil right to own and carry property. Having a firearm, if you're doing nothing wrong, is not a crime. What a concept. A woman can put a handgun in her handbag and go about her day without fear of arrest. Under the infringement of so-called "reciprocity" schemes, your human and civil rights as an American have been reduced to a list of government-approved states for licensees only, when you leave your home state. The 98% of the public that refuses to jump through the hoops, be taxed, get on the criminal database and get "rights" papers is left out in the cold when they travel under the current model. Enormous police effort that could be going directly toward reducing crime is instead being diverted into registering, regulating and tracking the innocent. The biggest argument against government-free Constitutional Carry is that it does away with the required training for a carry license. Training is good, we all agree. But are too many trainers now lined up at this government-made trough to feed? Are they afraid they won't be able to make money like regular entrepreneurs, if government doesn't force people to attend their classes? There is also a fear that if people bear arms without the enforced classes, the dumb idiots will kill people out of stupidity -- sort of like the argument the anti-gun-rights people make about guns in general. That's false of course, since less than 2% of the public gets a license and hence the required class, but half the public has guns. The 50% of the people who have guns without the king's permission slips seem to get along just fine without being forced to take a class under penalty of arrest. This however is the silver lining of Constitutional Carry. With your rights restored, and training provided on a voluntary basis, trainers will be free to offer classes to the general public the way General Mills sells cereal. Everyone should have some. You want some of this? It is so totally American, and by replacing the current state of TV-fueled gun ignorance with enlightenment and understanding -- accidents will drop, safety will improve, national readiness will skyrocket, and the fear that there won't be enough training opportunities will fall apart as the stale BS it is. Call -- don't write -- your local gun-rights chapter, even if you're not a member, you fool. Find them in our National Directory. Tell them you would support Freedom To Carry in your state. Tell them you would join (or donate) if they draft a Constitutional Carry law. Get this ball rolling. You're an American. You can do this. The left and right are gearing up for a major Bill Of Rights smackdown at the U.S. Supreme Court on March 2. Chicago's gun-ban law, and total arrogance toward the Second Amendment, is on the chopping block. Long-time activist Ken Rineer in Tucson staunchly supports his contention that if we win McDonald v. Chicago we may weaken 2A by subjecting it to increased federal rule. The 14th Amendment is at the heart of this case -- states cannot deny the rights you have as an American. That's at odds with principles of federalism -- states have powers and abilities separate from federal control, sometimes but inaccurately referred to as "states' rights." People have rights, governments (if they're legitimate) only have delegated powers, from the consent of the governed. Ken says, "If we 'lose' McDonald v. Chicago, it's not necessarily a bad thing, because it will make more robust the state renditions of RKBA. It might even generate a Kelo effect, with states jumping up to the challenge of strengthening their own Second Amendment versions at the local level, and weakening federal efforts at usurpation. "No matter what Congress does or doesn't do, the natural-law values of freedom should trump 'legal' action." The majority of gun policy experts I've spoken with discount this argument, vigorously pushing for and hoping to bind the states to the Bill of Rights. This has led to enormous support in this gun case even from the anti-gun-rights left, who see a win having enormous potential for advancing all sorts of wacky civil-rights causes, with federal authority as a club to hit states with. That's dangerous, since some of these claimed civil rights are artificial inventions or distortions of the Bill of Rights itself. A key example is the so-called separation of church and state, which is not in our founding documents. The BOR prohibits government from making any law limiting the free expression of religious belief. Leftists have used the courts to turn that upside down. The first case was minor in 1947, the big bang came in 1962, with feds now literally prohibiting free expression of religious belief (see "America's Godly Heritage" for a concise coverage of the issue). I have been granted a reserved seat at the U.S. Supreme Court for the oral arguments, and plan to issue eyewitness reports from there, as I did with the Heller case. I hope we have chosen the right path. Time will tell. Mr. Obama plans to open a nearly unused prison in Illinois to house prisoners currently being held at the Guantanamo Bay military facility. Local residents are overjoyed because this could bring as many as 3,000 jobs to the economically depressed community. "The prison is safe and secure," claims unidentifiable government spokespersons. The pundits are busy screaming about granting rights to enemy combatants, bringing terrorists to U.S soil, making Illinois the target of future jihadi attacks, granting a world stage to evil, possibilities for escape, radicalizing other prisoners and people at the prison, and they're correct about all that. But with massive prison overcrowding we keep hearing about, why is this joint empty? Why was it even built? The media has failed to ask. With a total of 198 prisoners at Gitmo, why do we need to fund, according to published reports, 3,000 frickin employees at a local prison? The media failed to ask. What will those 3,000 tax-paid people be doing with 198 prisoners of war? The media failed to ask, simply parroting the wonderful employment opportunity figures handed them by government, who sees this as a jobs-creation bonanza. Islamist warriors as a jobs program -- think about that. Can these Muslim jihad terrorists (the administration and their media sycophants prefer to label them "extremists") cause our financial collapse by simply getting arrested, at a rate of 15 employees per jihadi? In a funding letter, the Brady organization has praised recently confirmed Justice Sonia Sotomayor saying she, "has a sterling record and will help bring the nation's highest court back to its senses on the issue of keeping guns out of the hands of criminals." Claiming the gun lobby has been stopped in its effort "to allow dangerous people to carry concealed weapons in more places," they lament that Congress adopted a "reckless amendment that will allow people to carry loaded guns, including AK-47s, in National Parks." You can almost see the veins bursting in their necks as they turn red with trumped up terror. Fortunately (according to the Brady's), who "gave Sotomayor our public endorsement and fought tirelessly for her... even 12 Senators who have an 'A' rating from the NRA voted to confirm her." We saw similar incomprehensible Republican votes to confirm anti-gun-rights AG Eric Holder. Neither party appears to represent the values of those mainstream Americans still clinging to their guns and Bibles. Some say there may be hope in the newly aroused "T Party." The gun ban in National Parks ends in February, if the administration doesn't act. All's quiet so far on that front. A lone gunman under obvious psychological stress opened fire with semiautomatic assault weapons on a group of defenseless soldiers near a school graduation at Ft. Hood, Texas, killing 13 and wounding dozens of others, until he was shot and stopped by courageous first responders who arrived in only four minutes, or maybe ten minutes, and are being hailed as heroes. The motive for the attack is under investigation. The reporting on this was so typically atrocious it is nauseating. First the jihadi murderer (called 'a lone gunman' by the media) was dead, then he was not. He was an angry Muslim (but this was played down until it could no longer be played down). He was shot by a woman cop (which later turned out to be untrue, maybe). She was widely hailed as a hero (no, the media hailed her as a hero widely). Motive investigations are not needed for infidel-hating Muslims who carry soldier-of-allah cards and scream allah akbar as they follow their religion and kill infidels. And wrap my head in duct tape so it don't explode -- every station showed that damnable footage of space-ranger-lookalike SWAT people clumsily climbing out of a black panel van, geared up for nothing, arriving too late for anything -- except to have their pictures taken and replayed and replayed until you could puke. The media, with nothing to say, said nothing over and over. They should be ashamed. They're not. They're still showing those meaningless too-late-for-anything bogeymen in cute black assault outfits, but at least, unlike our military, they had guns. Tell me again, how long does it take them to suit up like that? Profession of Arms? Learned helplessness in the military. Had Wednesday's serial murders at Ft. Hood taken place just outside the Base in the City of Killeen, TX, the murder suspect would likely have been gunned-down immediately by several Texas CHL holders. Tragically, the murders took place in a "gun-free zone" (aka "criminal empowerment zone"), because in America, among those claiming to be active members of the "Profession of Arms," no one is armed! Any gun that is "perfectly safe" is "perfectly useless," and its owner is "perfectly helpless." I spoke to the East Valley Marines last night, retirees still active. Quite an honor, on the birthday of the Corps... They were not in favor of arming soldiers on a military base. Now that was a shocker. At least it was to me. They're completely used to having arms controlled by the command structure. They see it as proper, no problem with that, didn't connect being disarmed with the murderous assault by the jihadi whose name, unlike in the "news" media, deserves no mention here. There's a security force at a base that is armed and they support that, but which like the police, I pointed out, are only minutes away when seconds matter. They felt if soldiers were armed there'd be trouble, because they get angry, and get drunk, and basically, they didn't trust themselves or the system to simply be armed as a routine matter. So how did they feel about civilians carrying firearms with the freedom everyone should have? Mixed bag. They certainly didn't connect the civilian Second Amendment model with being in the service. A friend said they are so dependent on the government for so long, they're not freedom-conscious like some of us out here are. They were not fully comfortable with the idea of Constitutional Carry. To say they were, as a lot, regimented, would be accurate. Wonderful guys, but they are cut from a common cloth, and that includes when you get back from the front lines and go to the rear, you turn over your weapons until you need them again. The unarmed victim zone of Ft. Hood, well, they didn't see it that way, focused much more intensely on why government didn't identify and remove the Muslim warrior who perpetrated the atrocity. I asked, do they think they're vulnerable to this in the future? That didn't move them any closer to the right to keep and bear arms, or the need to keep and bear arms, or anything related to having arms without the command structure saying OK. They stayed with finding these rascals and dealing with them in time... a good deal of anger over not dealing with this guy in time. So is another base vulnerable to this sort of assault? They didn't think so (but they didn't convince me very well, but what do I know). And you should have seen the animus when they started in about how under Clinton, with the downsizing, protection of the gates was farmed out under contract to private firms! Yes, that's right, not a big secret but not widely remembered (except by them) -- the front gates are staffed by civilians, not military personnel. They didn't sit well with that, and I'm being nice about it. In the latest in an ongoing effort to deceive the public, government officials are once again claiming success in the failed drug war on the U.S.-Mexican border. The shooting death by government gunmen of Mexican businessman Arturo Leyva, who was involved in growing and delivering forbidden plants to eager American customers, was touted as a blow to the man's firm. Instead, the business was simply taken over by the dead man's brother Carlos, who has now been taken into custody, leaving leadership positions there up for grabs. "I've watched them do and say these things for 30 years," said one newspaper reader. "They brag they got the kingpin and seriously injured the drug business. After 30 years of that, with drugs readily available and at competitive pricing, why do they expect us to believe it anymore?" Indeed, says the Uninvited Ombudsman, and why do the "reporters" and editors keep forwarding the misleading and self-evidently false stories? It was unknown at press time which Mexican workers would be promoted into the vacant slots in the business. "Ees a veectory for us, si," said one cartel member on condition of anonymity. "Now, gracias to thee federales, there ees a chance for advancement for mio, and better life for my familee." In other news, complaints have been quietly raised about the one-year-old U.S. policy to pursue no smugglers importing 500 pounds or less of marijuana, a weed that grows wild everywhere and is cultivated for its alleged relaxing properties. Government gunmen now turn the smugglers over to Mexican authorities for prosecution instead of keeping them for prosecution. http://tinyurl.com/y8tk5xr It was unknown at press time whether the cost savings to U.S. taxpayers, or financial burden on destitute Mexican authorities, would effect gross domestic revenues. The United Nations is praising the United States and South Korea for lifting travel bans on people with HIV and is urging 57 other countries with travel restrictions to end them. U.S. President Barack Obama signed a bill late last year to overturn a 22-year-old travel and immigration ban against people with the virus that causes AIDS, and it came into force on Jan.3. http://tinyurl.com/yl8q6pd. "If we want to be the global leader in combating HIV/AIDS, we need to act like it," Obama said at the White House before signing. Allowing people to simply enter the United States with a highly contagious, virtually untreatable and lethal disease is praiseworthy... how exactly? "More than 1 million people live with HIV/AIDS in the U.S., and more than 56,000 new infections are reported every year," says the Huffington Post, which notes that having the disease carries with it a social stigma, but failed to note the death-rate stigma -- 6,000 people daily, according to Harold Pollack writing for The New Republic Online. It would be a front-page story, he said, but after 30 years it has become "boring." Maybe this new health-care policy of Mr. Obama can breathe some life back into the moribund subject. "KUALA LUMPUR, Malaysia — Fifty-two unmarried Muslim couples face charges of sexual misconduct and possible jail terms after being caught alone in hotel rooms by Islamic Morality Police during a New Year's Day crackdown," according to an unbylined article from the Associated Press. Fortunately, unmarried close proximity in a private place for Muslims only carries a two-year prison sentence and a fine. That must be why feminist groups nationwide have been deathly silent about the pre-dawn raids. Information birdogged from nightclubs in America suggests the hottest new pickup line is now, "Hey darling, let's khalwat." Lester Shuban, a chemist doing research for the Justice Dept., learned of DuPont's new material Kevlar, advertised as "stronger than steel, lighter than nylon." Working with a friend at the Aberdeen Proving Grounds in Maryland, he wrapped a phone book with several layers of the new fabric and shot it with a .38 caliber revolver. The bullets did not penetrate. He got his hands on $5 million from Justice, developed prototypes, and went on to impressive tests on a series of volunteer... goats. In 1975, when a Seattle cop walked in on an armed robbery and was shot at point blank range, and survived, Kevlar vests soared to popularity and have reportedly saved thousands of lives. This, by the way, and contrary to government schemes, is the most classic American method of job creation -- invent something that doesn't exist that everyone wants, and sell zillions. It's an olden method known as profit-driven capitalism. Capitalism has moved more people out of poverty than any other system known to man. Bullet-resistant clothing, a purely defensive tool, is legal for the public in most places, though politicians have for some time tried to outlaw it for innocent Americans. For people who are afraid of guns, Kevlar is a nearly perfect defense mechanism, as long as it remains legal. Committing a crime while wearing body armor is an aggravating circumstance, increasing the penalty in many states. A warning to armed citizens who may face government dynamic entry teams wrongfully breaking into their homes by mistake, "You only think you're armed if the other guy is wearing body armor." Talk-show host and Watergate accomplice G. Gordon Liddy took endless rebuke and support for recommending what to do in such a situation. Do you remember what it was like when you were a kid and all the lights went out during a storm? The eerie quiet, flashlights and candles, keeping the fridge closed, relating to each other without a TV or radio? Wasn't that cool? You can enjoy those good times again with a Power-Out Party. Much less intense than spending a day without your cell phone or with your car in the shop, a Power-Out Party is a practical way to have a great time with friends, and get back in touch with values you may have lost. Have lost. Pick a time before sunset, like 4 p.m. Invite people to your house. Tell them no battery watches, portable electronics, nothing if it runs on power, including batteries. They'll grumble, but the good ones will go along. Gather all your never-off household battery devices (clocks especially), put them in a box, put the box in your vehicle, and drive the vehicle off site. After everyone arrives, throw the main breaker. Yes, you'll be afraid to do it. But the world will not end. Are you too much of a sheep to try it? The unnerving quiet! Who knew how much noise all those pilot-lighted transformers and geegaws make! What conversations! People can't get over the sublime stillness, the utter sense of peace and rest, the ability to speak uninterrupted by every contrivance of modern life. You of course thought ahead and made candles ready as night falls (matches need no power and so are acceptable, fun, and smell nice), and coolers (also powerless) filled in advance keep libations handy (the fridge door is taped shut to prevent 100 force-of habit attempts to open it). Acoustic instruments suddenly take front and center. Board games and cards have more magic than usual. Charades by candlelight! And you end up with an experience you won't soon forget. It gives you perspective, if you have the nerve to try it. You're an American. You can do this. Postscript: Swear off your computer and phone for one single day, and watch as you make every pile of paper and junk in your place disappear.